Rental Registration #: 18-2447 Sail, swim, kayak and water ski directly from your backyard with over 100 sqft of harbor beach frontage and a boat mooring. Stunning views of Three Mile Harbor from almost every room in this 4 bedroom/4.5 bath home (including 3 ensuite masters). 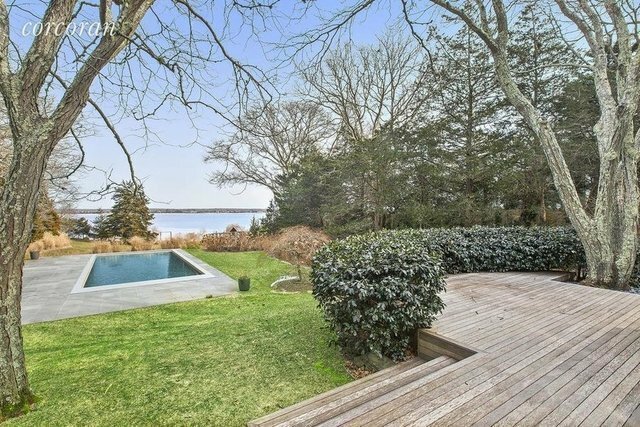 Enter to a double height great room with fireplace and a wall of windows facing harbor. Open dining area off a large kitchen with island. TV room with harbor views and a separate private office. Twin bed room with ensuite bath on first floor. Private second floor has a master suite with king bed, ensuite bath and sitting area all overlooking harbor. Another second floor as two additional master suites with king beds and ensuite baths, one with views of gardens, the other overlooking harbor. House rental includes 3 fiberglass sea kayaks, an opti sailboat and a canoe all with necessary life vests, paddles. Gunite pool (18'x45') with lockable, electric auto pool cover for safety and pool heat maintenance. Four garden boxes for vegetables and herbs. Beautifully landscaped, huge yard (over 1.1 acres) for entertaining and sports, filled with hydrangeas and a kids' play area. Double chaise on harbor beach for sunrises/sunsets and a fire pit for marshmallow roasting..